When we think movies pertaining to the end of the world, we immediately think of the blockbuster mentality. Perhaps we think of "Armageddon" and "Deep Impact" and how those two similar movies came out pretty much right after another. Perhaps you will think of Roland Emmerich and "Godzilla," "Independence Day," "2012" and "The Day After Tomorrow." Perhaps you will think of "The Hunger Games" or "The Maze Runner" or the fifty other novel-turned-movie-franchises that are currently making bank. The bottom line is the apocalypse seems to be a commercial seller, and there are rarely any movies in this small little subgenre that can be considered small. When I sat down to watch "Z For Zachariah," I had no idea it was based off of a novel of the same name. I have never heard of the novel, and so I definitely have never read it. I have no idea how close it comes to being a true adaptation of the source material, if at all. All I have is the movie to judge, and from the movie, "Z For Zachariah" is small yet strong chest of wonders. There are only three actors present in the entire movie, and their performances speak volumes about humanity, courage, and survival. The movie is short and sweet, it gets right down to the point. But by the end, you feel like you have had a lifetime's worth of experience and revelation, which is what I loved most about it. The movie follows Ann (Margaret Robbie) who has been living in solitude after some form of radiation destroyed life on the planet. She has been living alone in a healthy valley for an undisclosed amount of time, and she's been getting by. All of that changes the day a man in a massive radioactive suit barrels through the valley, thinking he has found his own personal utopia. The man's name is John Loomis (Chiwetel Ejiofor), and he goes for a swim in a creek. Ann promptly stops him as the water flows from outside the valley and is still radioactive. Much of the first half of the movie deals with Ann helping Loomis recover from nearly dying of the poison. There is a bond that slowly begins to form between the two, so much so that they very much care for each other. That connection is threatened by the arrival of Caleb (Chris Pine), another survivor who stumbles into the valley. Caleb and Ann begin to hit it off quicker and seemingly better than she did with Loomis and you can bet that Loomis sees the instant connection. A big theme of the movie is jealousy and if any of you have ever gone through some sort of love triangle or some jealous facade, you will definitely relate to this portion of the movie. There have been times when I was growing up that I was overwhelmingly jealous about something, and parts of this movie sent flashbacks to that rotting feeling inside you when you really want something to go your way, but your best efforts don't add up. Caleb is a magnificent character recognizing the want and need in both Ann and Loomis and twisting those wants and needs whenever he can get a chance. Its a great role for Chris Pine and he displays some of his finest work in his entire career. This may sound like a perfect role for Pine, but I can assure you that he approaches this character in a way you would never expect. The real standout in this movie is Margaret Robbie. Yes, this is the same girl from "The Wolf of Wall Street." Yes, this is the same girl who will play Harley Quinn next year in "Suicide Squad." So far, I have enjoyed Robbie's work, but at first she kind of came off like a billion other actresses. From this point on, Robbie has come into her own. She instantly becomes a master of a Southern American accent, but she treats Ann like a real person, not just some character on the page. We feel every passing minute in the shoes of Ann, which is a powerful duty of any actor, and Robbie makes it all look so easy. She bounces off of Pine and Ejiofor with a genuine amount of ease, and the result is three actors delivering every minute of every frame. There is no big finish at the end of "Z For Zachariah." There is no CGI fest. There is no major battle with radioactive mutants or aliens or anything of the sort. But that doesn't mean nothing of merit occurs. 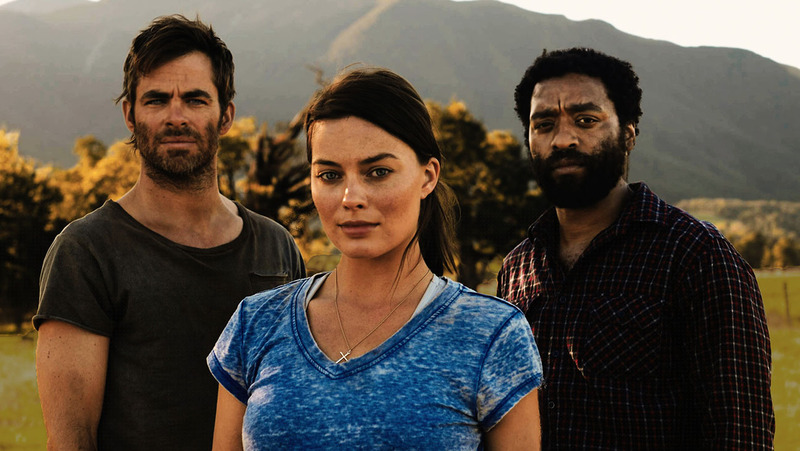 "Z For Zachariah" is rich with character and the final ten minutes of the movie will definitely give you something to talk about after the credits start to roll. Already I am wondering if the ending meant one thing or something totally different, and its something I didn't expect from this type of movie. "Z For Zachariah" maybe different than your average apocalypse movie, but the story is told in a bold and beautiful manner. Mix that with the cinematography by Tim Orr and the score by Heather McIntosh and you've got a breathtaking tale of the end of times.